Today, I'm cooking amaranth leaves with shrimps. To those who are not familiar with amaranth leaves, they look very much like the spinach. Amaranth leaves are good for kids because this vegetable is highly nutritious. It contains loads of proteins, irons, potassium and zinc. It is low on calories, with no cholesterol content; so if you're watching your figure, amaranth should work for you, too. Let's start cooking amaranth leaves with shrimps. 1. Pour cooking oil in a hot pan. 2. Saute' the garlic until golden. 3. Add in the tomatoes. 4. Put in the yardlong beans. 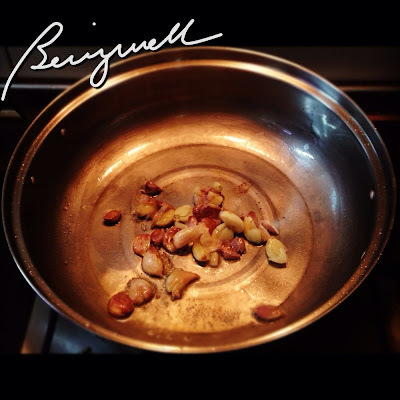 Stir until the color of the beans change to a vibrant green. 5. Add in the shrimps. 6. Add in the amaranth leaves. Stir well. Wait for them to lose dry texture. 7. Add some hot water so the leaves can be mixed easily with the dish. 8. Season with fish sauce, a bit of oyster sauce and pepper. 9. Stir well until cooked. If you want a spicy dish, add the chili at this point. However, if you want a spicier dish, add them with the garlic in Step 2 above. 10. Remove from pan until serving time. 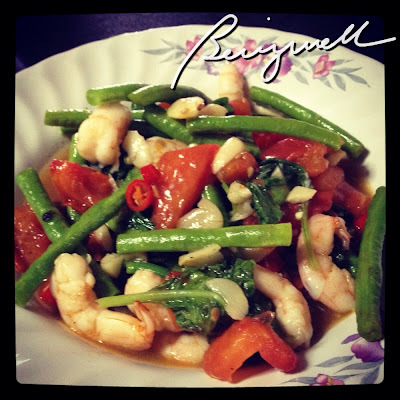 The vegetables and shrimps cook very easily under heat. Leaving them in the pan may over-cook your dish. If you have to leave the dish on the pan, place the pan on a cool surface and do not cover. This amaranth dish is very easy to do. You can replace the shrimps with chicken or pork, depending on your preference. Remember me when you cook!! Another yummy recipe with aramanth leaves! Uy akala ko nasa Pinas ka, Bangkok pala. hehehe! Kaya pala karamihan ng recipe mo may sili.hihihi! Mahilig talaga ako sa maanghang. Pag nagpatis ako dapat may sili. Do we have aramanth here kaya? 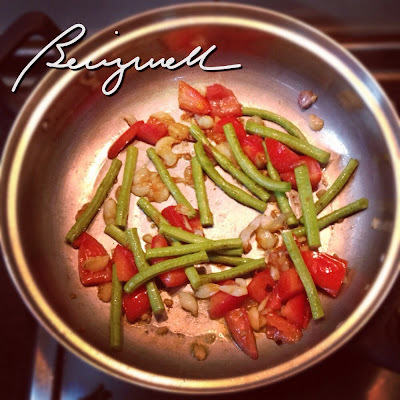 I want to tey that recipe, I love veggies! Love how you cooked it, the veggies still looked crunchy, i don't like soggy veggies eh..eww! Nice food, healthy living tayo! Looks delicious and very detailed instructions in cooking it. Looks like a really delicious dish. And the instructions are clearly presented! I'm not a cook and I'm not quite familiar with amaranth leaves. Now, I've got an idea. Nice recipe by the way! okay, I want to eat this (our cook will cook it...heheh) but what is amaranth in the local language? I love shrimps so I think, I'd be trying to cook this at home one of these days. I am just curious if there can be a substitute for the amaranth leaves? I love you recipes talaga.. THey are all healthy foods.. Love this one. This really looks good, with the vegetables on it. Will try this if time permits. Amaranth in Filipino is kangkong. Isn't it? No idea. 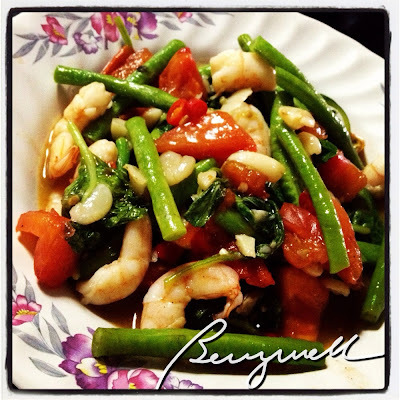 I want to have a good try of eating Amaranth with shrimps in hot spicy! No, sir. Kangkong is morning glory. Amaranth is kulitis in Tagalog. I'll definitely try this within the week.. I'm sure my folks would love this! 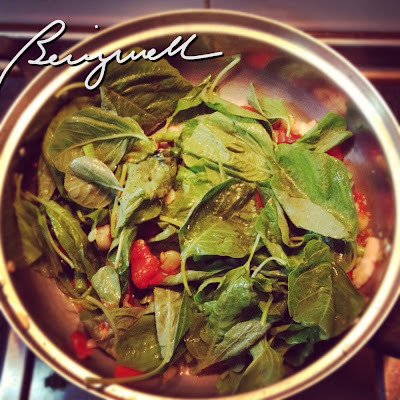 ;) Thanks for sharing such a healthy yet sumptuous recipe. looks yummy and really healthy too! want to taste this amaranth leaves with shrimps.